The very first screen you'll see when you access the Sales Center is the Profile Management area. Here you'll see a list of your active profiles separated by location. To edit the information contained on any of your profiles, simply click the Edit button and you will be presented with a list of questions and fields to complete. 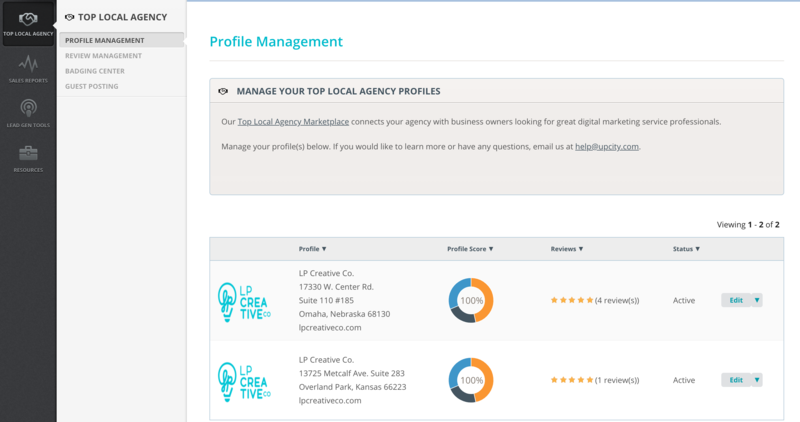 To ensure that you rank well on the Top Local Agency Marketplace, you'll want to ensure that your profile score is always at 100%. Luckily, we provide you with a handy scoring rubric at the top of the profile edit page and each field includes a description of how it is weighted.